In the 1950s, houses took root where peonies had grown. In the 1960s, Highway 62 separated a couple blocks of Minneapolis from the rest. Other city territory was ceded to the airport. And in 2017, my six-mile walk through the southeastern portion of the Diamond Lake neighborhood wound its way through all of this. In the route as I actually walked it, I used the black connector as planned, but after observing the pedestrian bridge shown in purple, I walked it as an additional spur, forward and immediately back. Starting out eastbound on 60th Street, the houses I initially saw were still from the 1940s, like those I had seen further north on my first day. As such, they were still generally one-and-a-fraction stories high with gabled roofs. A relatively typical example is the house from 1945 on the northeast corner of 60th Street and 11th Avenue South. Although typical in architecture, it stood out for its landscaping. Placing those boulders on the embankment must have been quite a job. From my perspective as the passer-by rather than the worker, the labor was definitely worth it for the resulting visual interest. Although even something much smaller can also add a lot of interest, as I saw a block and a half further east. A few stripes of contrasting color really jazz up the broad white expanses of the garage doors. The details are important. The vertical stripes are symmetrically beveled on the bottom, while the horizontal stripes, though blunt-ended, provide a similar symmetry through their varying lengths. And the asymmetry is as important as the symmetry, not only in the use of three long horizontal lines versus two short vertical lines, but also in the fact that the verticals protrude less far on top and are squared off there. Garage on 60th St. E. for 5944 13th Ave. S.
After entering airport property at 15th Avenue, I crossed over the freeway on Bloomington Avenue (the route map’s black connector) and headed south to 62nd Street, which I followed to 14th Avenue. In the photo taken at that intersection, you can see visual evidence that 62nd Street is the border between Minneapolis and Richfield: the paving changes color down the middle of the street, up to the point where it bends south and becomes entirely in Richfield. After turning onto the portion of 61st Street that is south of the highway, I was surprised to see that there is a pedestrian bridge. (Recall, it wasn’t shown on the maps I used for planning. I added it to my route map in purple.) Although it is only accessible using stairs, that is presently not a barrier for me, so I walked it as an additional spur. Highway 62 Pedestrian Bridge Near 14th Ave. S.
To get back to the northern end of the bridge following my planned route, I had some more twists and turns to navigate: north on Bloomington Avenue to recross the highway, south on the northern portion of 15th Avenue to the northern portion of 61st Street, then north on 13th Avenue, which would eventually loop me around via 59th Street to 14th Avenue. Before I reached 59th Street, though, I paused on 13th Avenue to take a photo. The homeowner, Alice Ferdinand, saw me taking the photo and came out to introduce herself. She told me that she had planted the tree as a seedling and marveled at its growth over the intervening decades. She also pointed something out that is visible in the background of the photo: the transition from the 1940s houses that are north of here to the 1950s. Her own is from 1954. Likewise, the neighbor to the north, which occupies the central position in the photo, is from 1953. Although some houses of that age look similar to those from the 1940s, these two are typical in being single-story structures with hipped roofs, that is, roofs that slope down in all four directions, without gables. The same is true of the house south of hers, on the corner with 61st Street, and all the houses south of 61st Street, such as the example in the next photo. Urban development does tend to progress outward, so it isn’t precisely surprising that the southern portion of the neighborhood was developed more recently than the northern. However, there really is a quite sharp delineation, as though development paused and then suddenly surged forward again. My friendly local informant gave me the clue to understanding this when she mentioned that the land had been a peony farm. Ahah! If the firm closed down about 1952, that would explain why the various plats named “Franklin’s Nursery 1st Addition” and so forth were developed in the following years. As to Mr. Franklin and his family, more later. Of course, there’s more to see on a walk than just the houses. Heading north on 11th Avenue, about to turn left onto 61st Street, I was stopped dead in my tracks by a pair of boots sitting in the roadway. Completely aside from the incongruity of boots in the road on a beautiful day, I was struck by their arrangement, one pointing north, the other south, like a sculpture of Janus. In the 6100 block of Elliot Avenue, I photographed a group of three houses, all dating from 1954, to illustrate their contrasting rooflines. On the left, 6109 was extended upward in 2011. In the middle, 6115 retains its single-story stature and illustrates that gabled roofs were still sometimes used. And on the right, 6117 shows the more typical hipped roof. What I didn’t realize at the time was that the most interesting house in the photo is the one barely visible at the left, just sticking out from behind the expanded house. Perhaps I overlooked it because it is almost entirely screened from the road by two large evergreens in its front yard. Later I went back and got a photo angled in through the gap between the trees and the large house. This would have been totally at home in the older Cooper neighborhood, but here it is decidedly peculiar. It turns out to have been the Franklin family home, where Alonzo B. Franklin lived out his last years together with a daughter. The 1940 census shows them as living at the address 6119 Elliot Avenue; he was then 82 and died four years later. Speaking of Loren, after finishing with Elliot and 10th Avenues, I followed the gentle curve of Loren Drive from 62nd Street at Elliot Avenue to 61st Street just west of Chicago Avenue. This one curved block contains several novelties. To start with, I saw the emergence of attached garages. Next, as I neared 61st Street, I noticed some houses adopting more contemporary styles, whether in specific details or more whole-heartedly. Returning to my starting point and looking at the 5900 block of Chicago Avenue with fresh eyes, the 1940s duplexes and houses that had seemed so familiar when I began now stood in marked contrast to the areas I had just walked through. 5900 Block of Chicago Ave.
Editor’s Note: Max Hailperin is walking each of Minneapolis’ 87 neighborhoods, in alphabetical order. He chronicles his adventures at allofminneapolis.com, where the original version of this article was published April 19, 2017. We’re sharing them here at streets.mn. The pedestrian bridge is theoretically a nice thing to connect the closest neighbors, but it’s pretty worthless in the larger network. I hope one day to see that replaced with a more accessible bridge at 12th. I was also surprised those folks didn’t put up a fuss when the Bloomington Ave/Richfield Pkwy bridge over the Crosstown was reconfigured a couple years ago for the bike trail. The bike trail was a nice addition, but it meant losing the west side sidewalk that directly connected those Diamond Lake neighbors to the north. One other note about your comment about there being two 14th Aves/62nd Sts — more recently installed signage on 62nd St seems to use the name “N Frontage Rd” (see Penn and immediately west), although all official maps still designate it as 62nd St. Perhaps to alleviate this sort of confusion, although I guess I prefer using the grid number. Personally, I think most of the Minneapolis Crosstown frontage roads are overbuilt. An ~18 ft street with single sidewalk would probably be more than sufficient. Thanks for your additional clarifying context. I’ve seen several other places where there are approximately parallel roadways with the same name, so I don’t think there’s any danger of the historical grid completely giving way to uniqueness any time soon, but it’s interesting to see that the trend is running in that direction. Before the 1990s, the southern boundary of Minneapolis was straight along the 62nd Street line to the 46th Avenue line. Part of the Airport was in Minneapolis. I have always been curious about the de-annexation of the Minneapolis part of the Airport property. I asked City Council member Robert Lilligren about it once and he didn’t remember any details. I also have not been able to find any documents online re: the de-annexation…. I assume this was all part of the new runway construction. Richfield had a five-block-wide swath east of Cedar Ave removed. All of this land was purchased by MAC and removed from the incorporated City of Richfield. Only a single parcel east of Cedar remains in the City (and also owned by the City) — the Public Works garage that was built after the road reconfiguration. 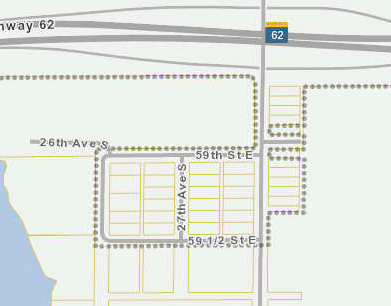 I am curious why the Solomon Park/Woods land (and the Taft Park) land is now controlled by MAC and not Minneapolis. In general, it looks like when MAC purchased land for airport purposes, it also left the City of Mpls. Oddly, that did not happen for the site in Bloomington at 24th and 494, which is used for some sort of active runway purpose. I wonder if Minneapolis had a preference for airport-owned land to not be a part of their incorporated City? I’m going to need to be careful when I walk the Nokomis neighborhood! I did not realize that little section south/east of 62 (which I bike or drive through almost daily on my way to Target, Home Depot, Chipotle, etc.) was in Minneapolis and not Richfield. Good info. Always thought that was Richfield too. But Taft Park is a Richfield property so I guess I’m still properly giving Richfield credit for building it’s parking lot entrances without bumps for crossing path users. Hah. Not sure if that was Richfield or Three Rivers’ design. But I appreciate that Richfield is pretty good about doing “driveway”-style aprons — rather than “intersection”-style ramps — for even major commercial parking lots. It seems like a lot of places, especially second-ring-and-beyond, have annoying up-and-down ramps that both make for a bumpier ride and makes it less clear for a motorist when they are crossing a trail or sidewalk. Come to think of it, even quite a few MPRB parking lots do this where they cross much busier trails. That’s pretty bad. Yes, the MPRB ones are mostly bad, which you particularly notice when you first put a child in a cargo bike and take a slow ride around Nokomis trying to avoid as many bumps as possible. Which is part of what makes me appreciate whoever did the Taft Park parking lot (others too, but that’s the one I go over most frequently).